From the foundation of the Irish Republican Brotherhood (IRB) to the fateful days of Easter 1916, when Irish Volunteers took to the streets to fight for our freedom. The first in a two-part historical feature. One of the main and lasting effects of the Great Famine of 1845-47 was emigration. The ‘Coffin Ships’ carried tens of thousands of the poorest Irish people who fled Ireland to avoid starvation. They created a new Irish nation within America whilst remembering the injustice of the English occupation of their homeland as well as harboring a deeply felt hatred of landlords and evictions. A Clann na Gael source estimated that there were over one and one half million people of Irish birth in America towards the end of the nineteenth century. These people supported the republican cause by giving money, weapons and, significantly, a publicity machine. The Irish Republican Brotherhood was formed in a Dublin timber-yard on Saint Patricks Day in 1858. James Stephans was assisted by Thomas Clarke Luby, James Denieefe, Garret O Shaugheynessy and Peter Langan. Joe Denieefe brought financial support back from America. He had left Ireland after the Ballingarry defeat in 1848. James Stephens , Michael Doheny and the John O’Mahony fought in Ballingarry in 1848. Stephens was injured but still manage to escape to Paris where he familiarised himself with the revolutionary tactics of that country. He came back to Ireland to try to establish an underground organisation to remove the English from Ireland. Denieefe and Luby traveled the country extensively and organised military groups called ‘circles’. They formed oathbound secret societies of loyal patriots. Popular opinion did not support the revolutionary ideals of the IRB nor did the Church whop were strongly opposed. The mainstream support came from the poorer classes who, despite their poverty, were often highly idealistic. At the time of the 1867 rising the membership of the IRB was estimated at over 80,000. Informers such as Corydon and Magle did untold damage to the IRB by betraying their oath and giving information to the English. The Fenian movement split in America in 1865. John O’Mahony took over from the Stephans. O’Mahony was later himself to be deposed when his hesitation in calling an insurrection dissatisfied the soldiers he commanded (many of which were veterans of the American Civil War). Colonel Thomas J. Kelly, was appointed Chief of Staff of the IRB in 1867 and departed for Ireland. A rising was planned for February 1867. Chester Castle in England was to be attacked and simultaneous raids in Ireland were to be carried out. The English knew in advance however as the informer, Corydon, kept them informed. The news had not filtered through to the Fenians in Ireland and sporadic battles took place in Kerry and Dublin. The IRB was reorganised in Manchester in July of 1867 and a supreme council elected. Colonel Kelly and Jim Deasy were captured by the English and then rescued by the Fenians in a daring raid in which a police officer was killed. Allen, Larkin and O’Brien were hanged for their complicity in the events and they became known as ‘The Manchester Martyrs’. These mass funerals and events with the Land League focused the minds of the popular masses on the injustice of English rule in Ireland. 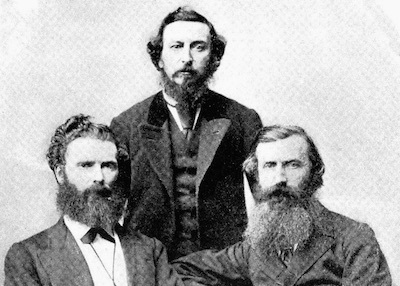 The IRB delegates in Manchester broke away from the feuding factions of Fenianism in America and supported Clan na Gael who were founded there in June of 1867. The objectives of Clann na Gael was to secure an independent Ireland and to assist the IRB in achieving this aim. John Devoy was the mainstay behind the Clan. Devoy became involved in the ‘New Departure’ and assisted Davitt and Parnell in their fight against the landlords. Independence remained his main aim however as he felt that the Land League was not militant enough to remove the landlords. Devoy, assisted by Doctor Pat McCartan, founded a newspaper, ‘The Gaelic American’. Doctor Pat McCartan transferred from Clan na Gael to the newly formed ‘Dungannon Clubs’, a separatist organisation which was denounced by the Church. Tom Clarke became a member of the Supreme Council of the IRB in 1909 and helped form the revolutionary paper ‘Irish Freedom’. He became the link with Clan na Gael in America. In 1912 the IRB sent Sean MacDiarmada as a delegate to the Clan convention and he succeeded in securing the enormous sum of $20,000 for the IRB at home. In November 1913 the Irish Volunteers were formed in Dublin and 4,000 enrolled on that first night. In 1914 Padraig Pearse went to America to raise funds to save his Gaelic school, St. Enda’s. This was achieved and Pearse turned his attention to revolutionary matters. “It is my matured conviction that, given arms, the Volunteers who have adhered to us as against Redmond may be depended upon to act vigorously, courageously, promptly, and unitedly if the opportunity comes. We are at the moment in an immensely stronger position than ever before. The whole body of Volunteers that has supported our stand against recruiting may be looked upon as a separatist body. In other words, the separatist organisation has been multiplied by a hundred. “In Dublin, we have some 2,500 admirably disciplined, drilled, intelligent, and partly armed men. Nationalist Ireland has never before had such an asset. Our main strength is in Dublin, but large minorities support us everywhere, especially in the towns and in the extreme South and West. We expect to have 150 companies, representing 10,000 to 15,000 men, represented by delegates at next Sunday’s Convention. “This small, compact, perfectly disciplined, determined separatist force is infinitely more valuable than the unwieldy, loosely-held together mixum-gatherum force we had before the split. The Volunteers we have with us now may be relied upon to the death, and we are daily perfecting their fighting effectiveness and mobilisation power. It seems a big thing to say, but I do honestly believe that, with arms for these men, we shall be ready to act with tremendous effect if the war brings us the moment. “The spirit of our Dublin men is wonderful. They would rise tomorrow if we gave the word. A meeting of Dublin officers the other night was as exhilarating as a draught of wine. The IRB were influential in many cultural and national organisations. Most of the leaders like Pearse, Plunket and McDonagh were fluent Irish speakers and were members of the Gaelic League. The Gaelic Athletic Association (the GAA) was formed by Cusack in November 1884. At the outbreak of the first world war, Redmond urged the Irish Volunteers to join in the fight against the oppressors of small nations (Germany). 170,000 of the Volunteers supported Redmond whilst 11,000 supported Pearse. Tom Clarke urged the Supreme Council of the IRB that a rising must happen before the end of the war, especially as the Irish Home Rule bill had been suspended at the outbreak of the war. Pearse, Plunket and Ceannt drafted the first military plans. Prior to the rising and thanks to Hobson, Casement and Childers, guns were landed at Howth and Wicklow. Casement went to Germany where he published the Irish cause in German newspapers. His efforts to secure weapons were dealt a severe blow when he and the weapons they were attempting to smuggle into the country were captured on Banna Strand. Casement, an English subject, was eventually convicted of treason and hanged. Thomas Clarke was the main instigator of the rising, supported by Pearse, Sean Mac Diarmada, Eamonn Ceant and Sean T. O Ceallaigh who went to America for further assistance. Thomas McDonagh, Joseph Plunket and James Connolly were later brought on to the Supreme Council. During all this activity Eoin McNeill was unaware of the secret body that was organising the rising. Few penetrated the IRB as they prepared for the rising. James Connolly used his paper ‘The Workers’ Republic’ to call for an armed revolt. He used the Citizens Army to protect the paper. The Irish Volunteers were holding recruiting meetings throughout Ireland and training enthusiastically. They awaited the signal to act as the rising had been set for Easter Saturday, 22nd of April, 1916. Setbacks to the plan included the capture of Casement and the weapons, the capture of Austin Stack, commandant of the Kerry Brigade and the discovery of the plans for an uprising following a raid on German officials in New York. The Supreme Council decided unanimously decided to proceed with the uprising despite the fact that they knew it had little chance of success. It was decided to strike on Easter Monday. In spite of the order from McNeill not to revolt, over 2,000 soldiers made a strike for freedom.